The elusive Knysna elephants - do they exist? You are here / South Africa Travel News / Destinations / The Garden Route / The elusive Knysna elephants – do they exist? Now reading: The elusive Knysna elephants – do they exist? The elusive Knysna elephants – do they exist? It is a bit like tracking down the Yeti, or Big Foot – trying to find out about the Knysna elephants. Information about them is inadequate, tends to lapse into lengthy descriptions about their history, or is shrouded in mystery. There are those who say they are so elusive that, if indeed they are there, they have yet to make their presence known. 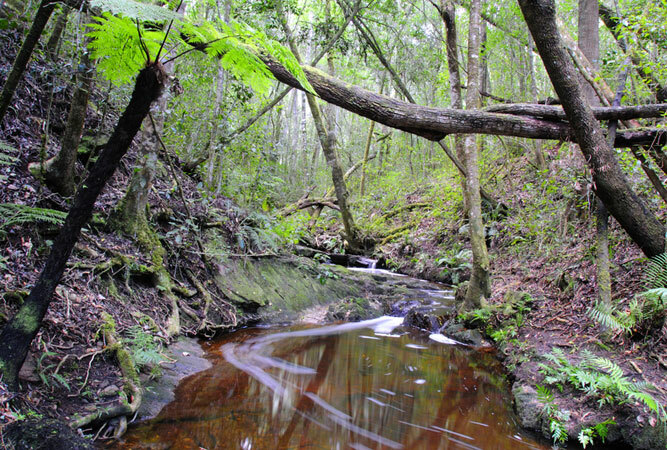 The ancient Knysna Forest brings to mind Daleen Mathee’s Circles in a Forest. It covers some 60 500 hectares on the southern slopes of the Outeniqua Mountains. Filled with ancient yellowwood trees, white stinkwood, rock elders, wild peach and pink-flowered Cape chestnuts, it is also a world of moss, tree ferns, lichens and streams, where the Knysna loerie, narina trogon and the olive thrush sweep from tree to tree (although you will have difficulty spotting them) and, if you’re quiet enough, the odd duiker, porcupine, caracal, or bushbuck might reveal itself. The forest’s inner sanctum is dense; the trees incredible. This is untouched forest land. The axes of the woodcutters who brought much of Knysna’s forest to the ground, did not make it here. SANParks confirm that they have strong evidence of one elephant. An elderly female. But there are those, like Gareth Patterson – an environmentalist, and author of seven books on lions, who has been tracking the Knysna elephants since 2001 – who say that far from the doomed population of one elephant, there might be as many as ten or eleven. Certainly there is evidence of five, previously unknown, female elephants and possibly some bulls and calves. A viable population. DNA investigation (Gareth Patterson in partnership with conservation geneticist Dr Lori Eggert has collected dung samples – a good source of DNA – and undertaken field research into diet, range and distribution of the elephants) suggests too that there is, in fact, a greater genetic diversity in this little population of wild, roaming elephants in the Knysna Forest than in the population in Addo Elephant National Park. He also suggests that they are closely related to the elephants at Addo. Interestingly, they are unrelated to the three elephants introduced from the Kruger National Park in 1994 in a bid to increase the elephants dwindling numbers. The two remaining elephants of the three (one of them died) were relocated to Shamwari in 1999 and the Knysna elephants declared by some as extinct. Genoptying of DNA from the dung samples has allowed the team to ascertain numbers of individuals, their sexes and the relationship between them. The Knysna elephants, now that we know they exist, are the only unfenced elephant population in the country. And they are not limited to the forest. 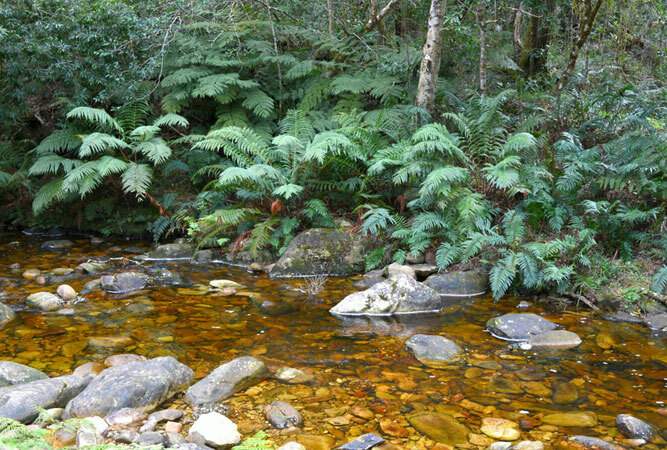 Patterson believes they range on national park, provincial, commercial and privately owned land, making use of the mountain fynbos and plantation areas near the forest. A hundred years ago there were as many as 600 elephants in the forest. Hunters, after their tusks for ivory, had a hard time tracking them down amongst the dense trees, which means their numbers were not intially unduly affected. Then gold was discovered in the area and a small town grew up near the forest, increasing the hunting of elephants to such a degree that by 1920 it was estimated that there were fewer than 20 left. Miraculously the Knysna elephants, despite apparently being functionally extinct, appear to have lived free in safety within their forest despite the intervention of man. Tracking them down has proved fruitless. They remain phantom, although one was recently caught on a camera placed in the forest for leopard research. But the DNA research based on their dung, and clues pieced together from the inner sanctum of the Knysna forest by Gareth Patterson, has revealed that they are still very much there.